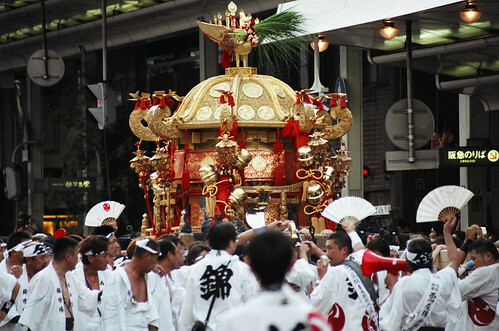 It is the month of July, a very important month for Kyoto because it’s the month of Gion Matsuri! You might have heard of it before since the Gion Matsuri Festival is one of the biggest and most famous festivals in all Japan. This festival actually originated for rather tragical reasons, because it started as a religious ceremony to appease the gods during an outbreak of plague in the year 869. Nevertheless nowadays it is reason for more than a million visitors each year to come to Kyoto and be part of a 1100 year-old Japanese tradition. 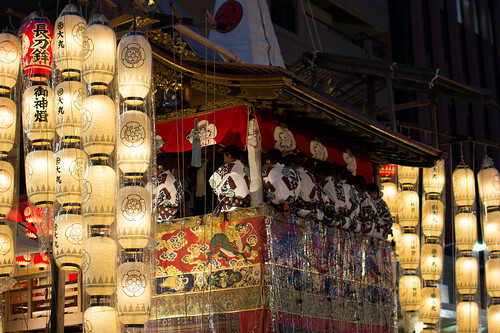 Although there are many different events during the entire month, the main events are definitely the two processions of traditional parade floats called Yamaboko Junko held on 17th and 24th July. The big floats used in the parade are about 25 meters tall and weigh up to 12 tons! About 30~40 people are needed to pull it. Since old floats do not install a steering wheel like today’s vehicles, I find it especially interesting to watch the process of making the float turn at a street crossing. 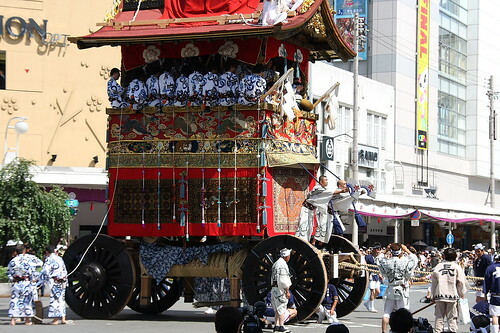 The processions of floats take place between 9:00 and 12:00 on the 17th and 24th and follow a three-kilometer route along Shijo, Kawaramachi, and Oike streets. You can find a detailed route and timeline here. Many of the visitors dress up in Yukata (summer Kimono) for the festival, walk around the area, carrying paper fans which makes the event very picturesque. Less known but not less exciting are the three evenings leading up to the procession known as Yoiyama (July 16), Yoiyoiyama (July 15) and Yoiyoiyoiyama (July 14). From 18:00 to 23:00 the streets are packed with people admiring the big Yamaboko floats that are on display. Meanwhile you can enjoy street food, drinks and traditional music!